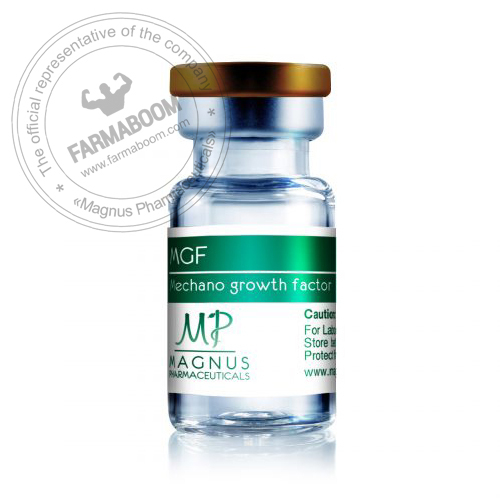 Mechanical growth factor (MGF, MFR) is one of the varieties of insulin-like growth factor IGF-1. The development of the IFR is a muscle response to any heavy physical activity, be it physical work or sports training. The action of the mechanical growth factor is aimed at activating the division of muscle cells, as well as the growth of muscle cell sprouts that are in a dormant state. Thus, the main functional purpose of the mechanical growth factor is to stimulate the growth of muscle mass. The body’s own production of a mechanical growth factor is not sufficient to achieve the required indicators, therefore, there is an injection form of a mechanical growth factor, the use of which helps to achieve the necessary results on the set of muscle mass much more efficiently and faster.